Christians have a reputation of being poor tippers, according to restaurant workers that I’ve known. Why are Christians poor tippers? And shouldn’t we instead be known as the best? 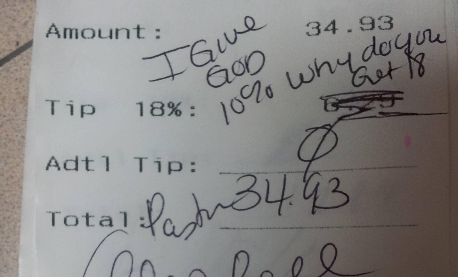 Consumerist recently shared a story that originally appeared on the atheism page on Reddit, and has now gone viral, about a pastor who complained about the 18% gratuity automatically added to her bill. A restaurant waitress (apparently not the server who waited on the pastor), wanting to make a point, posted a photo of the receipt (showing the pastor’s signature) on Reddit for all the world to see. She explained that the pastor was part of a group of 20, and that’s why the 18% automatic gratuity was added, per the restaurant’s policy. Thousands of websites have since shared the story, which made it sound like the pastor had stiffed the server and left without paying any gratuity at all. Since this story broke, believers and non-believers alike have expressed their dismay about how the pastor handled this situation. And now the perception of Christians – and pastors – being poor tippers isn’t just known throughout the restaurant industry but the entire world. The customer, who has been identified as Pastor Alois Bell, eventually found out about it and contacted Yahoo News to share her side of the story, which was that she left a tip on the table in cash. She then contacted the restaurant, Applebees, to complain about the fact that her privacy had been violated by the posting of the photo of her signature. Applebees has since fired the waitress, Chelsea Welch, who posted the pic. Yes, I’m sure millions of people do find it entertaining! But it is also very sad. 1. Christians should always treat others the way we’d like to be treated. You know, the old “Do unto others as you’d have them do unto you” thing. 2. We should be gracious and generous. Because that’s how we’ve only always been treated by God. “Freely you have received, freely give” – Matthew 10:8. 3. If you call yourself a Christ-follower, you should never cheat people out of what is due them. If the restaurant’s policy is to add an 18% gratuity for large groups, then we should be OK with that. I think we can all appreciate why they do it – because large groups often demand more from the restaurant staff. 4. Christians should deal with problems in a Christ-like way. You know…What would Jesus do? If the pastor had a complaint to make, she should have taken the matter up with the manager, instead of taking it out on the server. Sadly, there have been times in the past where I’ve observed people leaving poor tips. The worst is when people have left a modest tip and a gospel tract. Because they cared more about the server’s spiritual livelihood than their financial one, I guess. “Sundays, right after church, are the worst times to work in a restaurant,” a couple of friends have told me. In fact, they’ve been embarrassed to tell their fellow restaurant workers about Christ, based on how some customers, who appear to be Christians by their “Sunday best” and prayers before meals, treat the restaurant staff. Like it or not, restaurant workers depend on tips for their livelihood. The restaurant industry is set up that way. The workers get a very low hourly wage, and depend on tips for the rest. How much should you tip restaurant servers? It seems like the general standard for restaurant gratuity is 15-18% of the total bill. My wife and I always give a standard 20% tip to all restaurant servers, and we go up to 25% if we receive extraordinary service. And no, I can’t recall ever writing “Pastor” in front of my name when signing for the bill, thank you very much! When we host special events like the Global Leadership Summit, a Dave Ramsey event, or other conference or seminar, we always remind our guests at lunchtime that they need to tip well in area restaurants because they are part of our mission field and we to see the name of Jesus lifted up, not brought down. Have you heard people say that Christians are poor tippers, or experienced it first-hand? Please share your comments! Nice article! My wife used to work in a restaurant and people would purposely try to avoid the Sunday shift because of poor tipping. The other reason for not wanting to work Sundays was that church folks seemed rude and unkind! How sad! If a person can’t afford to eat out and leave a generous tip, stay home! Oliver, thanks for your comment. Yes, it is sad, but I pray that this whole episode will encourage Christians to be more generous when dining out. It’s extremely sad, but does seem to be the norm. I am blessed enough to go to a church that advocates generosity, and not being a complete cheapskate! I’m with you, I give 20-25%. The money’s not mine anyways, why would I be stingy with it when there’s a chance to be genrous?! I couldn’t agree more Rich. My mom use to wait tables before joining the military and she told me how much she relied on her tips to get by. 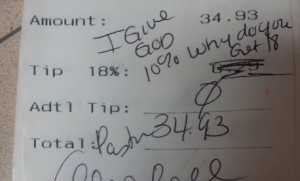 Fortunately I have never heard of Christians as bad tippers.